This summer the new 2018-2020 piano syllabus was published by Trinity College London and out of curiosity I thought I'd take a look. I've always been an ABRSM person, took their exams many years ago and now teach their syllabus to my own students. However in this post I would like to point out some of the differences between ABRSM and Trinity College and I would be interested in your thoughts, so please leave a comment below. First of all, ABRSM is much bigger worldwide than Trinity College and by many it is considered better. Being bigger, it has more exam centres and so unless you live in a big city like London, you might find yourself having to travel a long way to take your exam. Musical Knowledge about a piece you are playing. This means that a student can focus on his strengths - for example if you really find the aural difficult, you won’t be penalised. Then again, does the ABRSM approach make for a more all round musician? Should everyone, for example, be able to sight read or is it a cop out to let the student decide if he wants to avoid sight reading through his entire studies on an instrument? Let me know your thoughts in the comments below. The scales seem of a similar difficulty, but there are less of them in Trinity. Many students, especially in the higher grades feel inundated by the sheer number of scales they need to know for ABRSM. Is knowing the complete cycle of fifths both major and minor at Grade 5 piano a good thing or a bad thing in your opinion? To make up for the fewer number of scales, Trinity College has additional Technical exercises, short little pieces which test things like tone, balance, coordination flexibility whereas ABRSM tests this in the main pieces. Then there are the pieces themselves. My first impression is that they are a little easier especially at the early grades. I’ve made some video recordings of both the new Trinity College Piano syllabus and that of ABRSM. Have a listen and tell me if you think they are in fact easier than ABRSM. However, the difficulty of the pieces is not the only difference. In ABRSM you need to choose three pieces one from each of three lists A, B and C. In Trinity College, again you need to choose three pieces, but these can be ANY three from the whole book. There is even an option where one of the pieces is a duet, where your teacher would accompany you in the exam. You can even offer you OWN composition as an alternative to one of the pieces. The idea behind the ABRSM forcing you to play from three different lists, I guess, is that you will get experience of playing different styles of music. In my opinion, although the Trinity option might be more popular with students, that of the ABRSM in the long run might produce better all round musicians. What do you think? So in summary, my initial little curiosity has opened up a lot of questions as to the PROs and CONS of these two examining boards so please leave your thoughts in the comments below. Hi, I was interested to read your comments about ABRSM v Trinity. 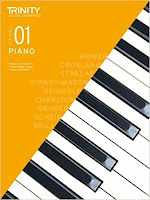 I am an adult learner of piano, studying for grade 3. In the past I have done Trinity exams (1 & 2) however this year I have switched to ABRSM because of comments suggesting that Trinity may not be of the same standard. I would like to say that I enjoyed my Trinity exams. At grade 1 I took the option to play a duet, obtaining full marks for the piece. Being able to play a duet help settled my nerves and gave me more confidence than I may have had, returning to music exams after 30 years. I have to confess I did choose my strong points in the supporting tests which again was confidence boosting. I believe your assessment of the exams, regarding duets and sight reading is not wholly accurate. I believe you have the option of a duet up to grade 3 only and that sight reading becomes compulsory at grade 5 and above. I would recommend Trinity exams to anyone who was a bit nervous at the earlier grades for these reasons. I have gone for ABRSM this time round as my initial aim was to get grade 5 ABRSM. This is a personal goal. After that, who knows? The LCM syllabus is also very interesting and as you point out, a good musician will stand out for his/her quality of performance irrespective of which exam board they sat. I personally feel that a good teacher is far more valuable than any exam system. May I also add that I am enjoying your site immensely so far. Plenty of good information for a beginning pianist! Thank you. Thank you for your informative and interesting comments. It is true that duets are only offered at the lower grades, my post wasn't very clear on this. Regarding sight reading also your comments help clarify the situation, however at Grade 5 there is still an "option" around the sight reading element. Only at the very top grades is it compulsory. My opinion is that sight reading is a skill that should be learned from the very beginning.